Live in Bend long enough and someone’s bound to ask you to go disc golfing. But there’s more to it than just getting out and throwing a Frisbee. We recommend going with someone who knows what they’re doing. Avid disc golfers go out with as many discs in their bag as a regular golfer has clubs. Seven to 20 discs would seem to be the standard for the serious disc golfer. There are discs that curve, discs for distance and discs to putt with—just like regular golf. If you’re just getting started, you need to pick up a minimum of three discs: a driver, a mid-range disc and a putter. 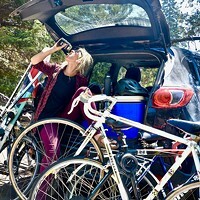 Check out Pine Mountain Sports, REI or Dicks Sporting Goods for gear. Pine Nursery and the COCC course are the two official courses in town. Pine Nursery recently got a major facelift. In years past it was an unofficial guerilla course, but Bend Parks and Rec has now installed nine official disc golf baskets and tee pads. If your game is up to par, head out to Mt. Bachelor or Willamette Pass later in the summer for their lift-served disc golf courses. Whatever you do, don’t take it all too seriously. This is a game meant to be played with buddies and beers in the woods. Good times.